The cool thing about our new DFRduino microcontroller is that the headers use different colors to feature I/O ports of different types, red for Power Section, blue for Analog I/O, green for Digital I/O. These colors match our sensor cables. 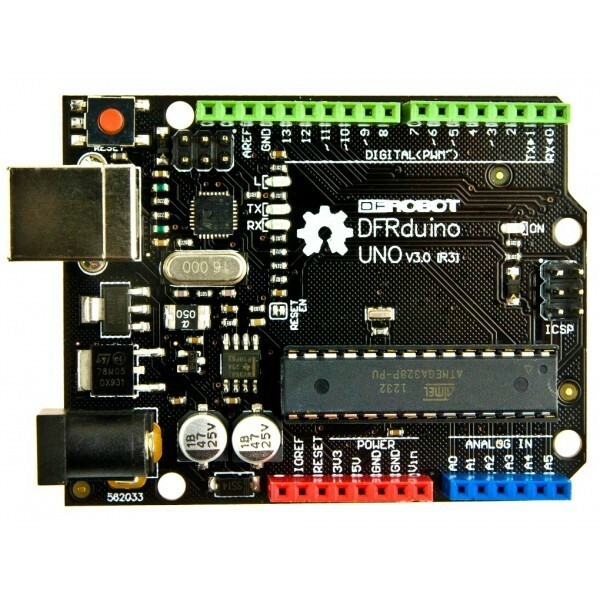 This is the DFRduino Uno V3.0 from DFRobot. 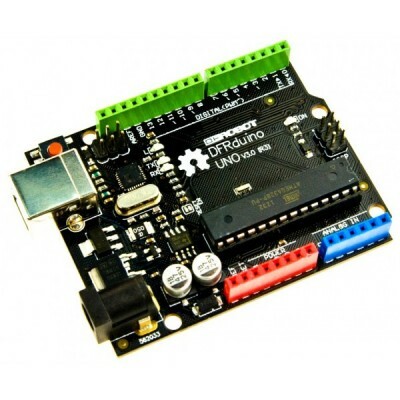 It is fully compatible with Arduino UNO R3. This board features the ATmega16U2 programmed as a USB-to-serial converter. An added bonus is that our DFRduino is still using the DIP package AVR Chip, which means you can remove it to update/reprogram the chip's firmware, or even to place it on a finished, more compact project. This makes it really easy to figure out where to connect sensors, or to identify which side is Analog(blue) or Digital (green). This board added SDA and SCL pins that are near to the AREF pin and two other new pins placed near to the RESET pin, the IOREF that allow the shields to adapt to the voltage provided from the board. Eventually shields will be compatible both with the board that use the AVR, which operate with 5V and with the Arduino Due that operate with 3.3V. The second one is a not connected pin, that is reserved for future purposes. DFRduino Uno V3.0 (1 unit). ATmega328P datasheet, Arduino Home Page, How to, Programming Reference. Digital I/O Pins: 14 (of which 6 provide PWM output). Flash Memory: 32 KB of which 2KB used by bootloader.